Happy Sunday, and happy December to you! It was about 38° when I woke up today, which means that it’s truly starting to feel like winter. I warmed up my apartment yesterday with a seasonal baking project, which I’m looking forward to sharing later this week. In last week’s weekend reading post, I expressed some of my conflicted feelings about the holidays. It’ll probably come as no surprise to hear that I wrote that post while I was feeling pretty low. Something shifted this week, and I’m feeling so much more grateful and at peace. Holiday feelings aside, this week was actually marked by quite a few shifts in perspective. It’s all evidence of something that therapy has helped me to realize, which is that, if I can sit with discomfort and pain without reacting too aggressively, change will find me. When my therapist first suggested that I work harder to accommodate difficult emotions–which is to say, not rejecting them at the onset–I was resistant. It seemed like defeatism to me, like a failure to harness my own coping tools or to proactively maintain a positive perspective. I don’t see her invitation this way anymore. Rather, I think it was astute, a gentle challenge for me to surrender some of my own attachment to control, which applies as much to my emotional states as to the more material dimensions of my life. It has been fascinating to allow time to do some of the work when I’m in pain, rather than trying to escape or resist. I guess it could be seen as a passive approach, but it’s quite a challenge nonetheless. There’s certainly a time and place for consciously summoning up a change in perspective, or to navigate a difficult situation with practical coping mechanisms. But I’m starting to wonder if it’s also a valuable practice to apply patience and curiosity to suffering–the former as a means of not panicking at the first inkling of pain, and the latter as a means of remaining receptive to what a painful experience might teach us. Waiting on change has taught me that what I feel at one moment is not destined to last forever, and–as I’ve mentioned in other, recent posts–this comes as a big realization. It also invites me to dwell a little more peacefully in uncomfortable places, because I know that they’re impermanent. I hope that, over time, the capacity to dwell will become also a capacity to learn. In some ways, that expansion is already happening. 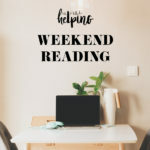 This week’s reading picks include some very interesting reporting on healthcare and medicine in today’s climate, from a look at the high price of pharmaceuticals in America, to a beautiful examination of online patient forums, to reporting on a new app that’s designed to help alleviate depression. And because I just couldn’t resist, there’s a heartwarming story of the bond between a cow and her calf thrown in for good measure. Enjoy the links, along with the following beautiful recipes. 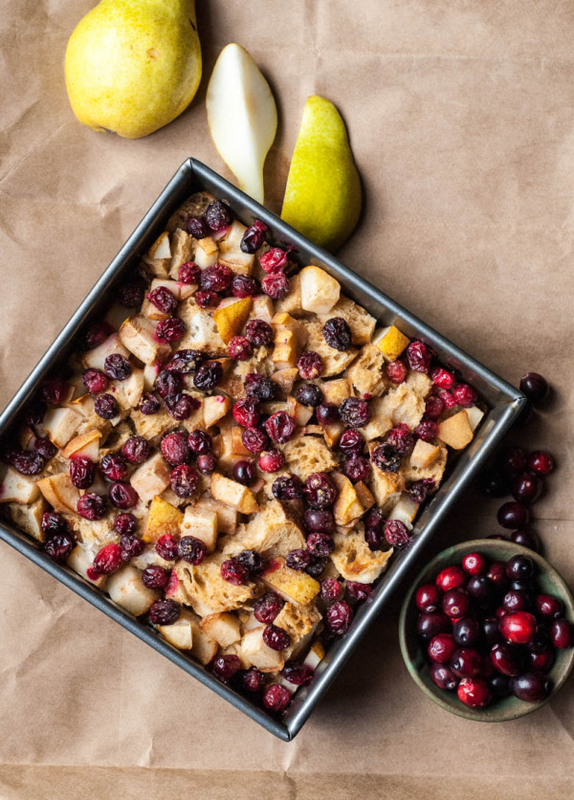 The next time you’re craving a special breakfast, why not try Abby’s beautiful cranberry and pear French toast casserole? It looks festive and fancy, but the recipe is actually super simple. Almond milk and chickpea flour take care of binding, while a few simple spices add plenty of flavor. 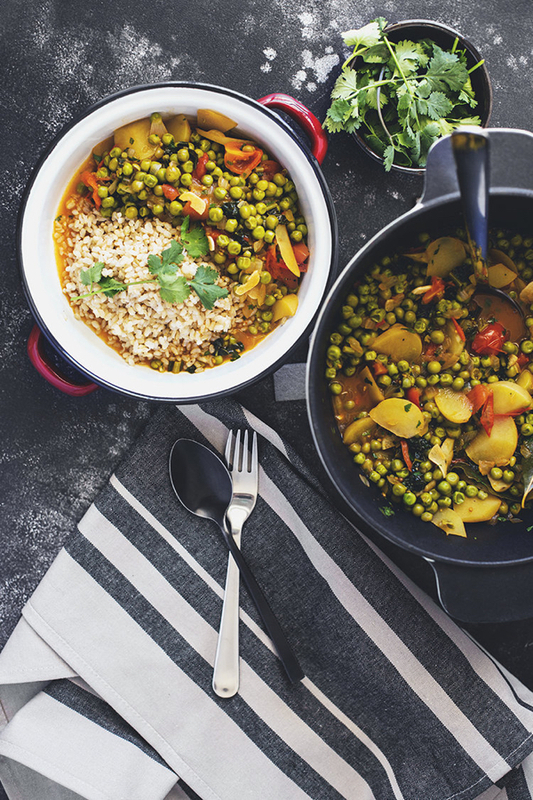 A vibrant, verdant Portugese pea and new potato stew from the folks at Cocoon Cooks. I love the colors and heartiness of this dish. 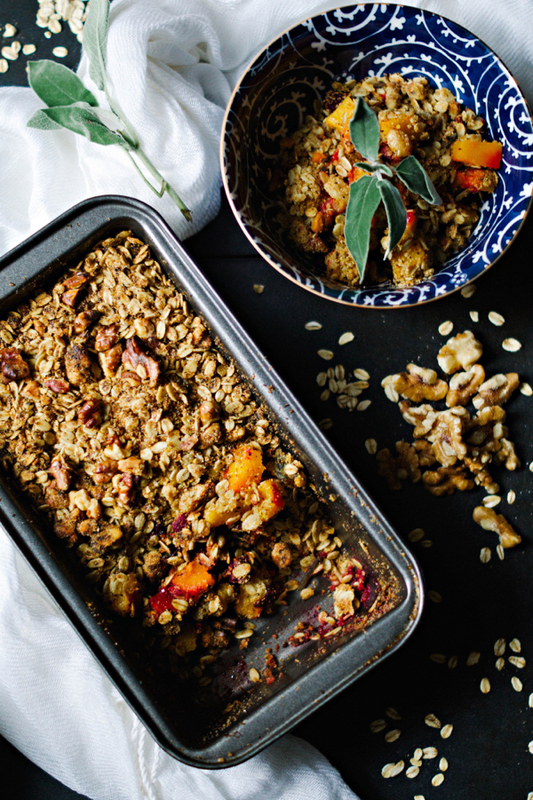 I’m bookmarking Maya’s delicious savory butternut squash and beet crumble for Thanksgiving next year. Such a cool idea, and I love the way the beets turn everything every-so-slightly crimson. Yum. Nothing beats a skillet meal that can be easily made with pantry ingredients. 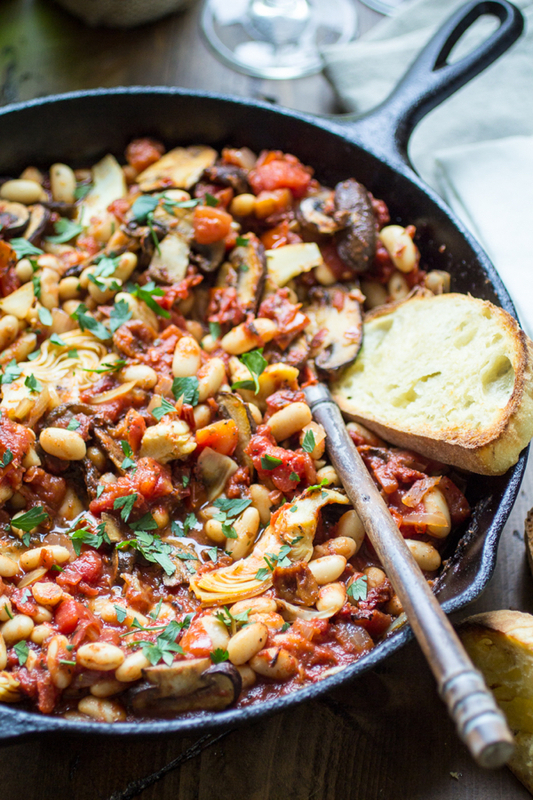 Anetta’s Tuscan white bean skillet with artichokes, tomatoes, and mushrooms comes together in about 30 minutes, and it’s so flavorful and nutritious. As some of you saw on Instagram, my Thanksgiving dessert offering this year was a veganized version of Erin McDowell’s caramel cider apple pie. 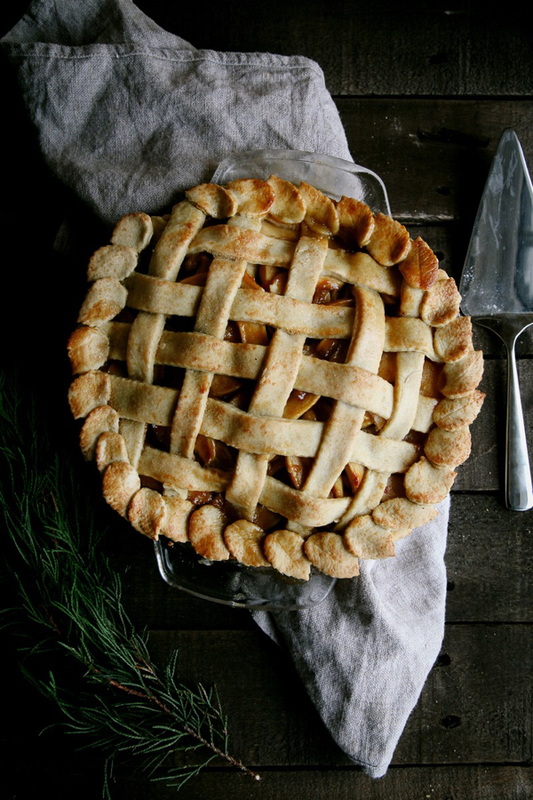 It was delicious–the cider actually added a mellow tartness to the dish–so I’m excited to see another caramel apple pie recipe, this one from Aimee of Wallflower Kitchen. She sold me with the addition of sea salt! I’m still stockpiling apples each week from the farmer’s market, so I hope to make it soon. 1. Vox takes a look at why medications are often more expensive here in the US than in other countries. It takes the commonly prescribed drug Humira as an example: on average, it’s about $822 in Switzerland, about $1,362 in the UK, and $2,669 here in the US. According to the article, drug prices are more tightly regulated in other countries for the sake of ensuring that they’re accessible to most people. Here in the US, prices can climb quite a bit higher. This is bad for affordability, but it does mean that people with venture capital are more likely to invest in drug research, leading to innovation and the promise of better treatments. Not surprisingly, many drugs that are unavailable in other countries can be had here–which isn’t to say that they’re affordable. So there’s a tug of war between making drugs more affordable to more people, versus incentivizing those who might pour resources into making drugs better and more diversified. Vox offers a straightforward, yet comprehensive analysis. 2. The American Dietetic Association, or AND, published a position on vegetarian diets (including vegan diets) in 2009, stating that they are safe and appropriate for individuals in all stages of the life cycle. This week, that position was revised to include the statement that vegetarian diets are also more environmentally sustainable than diets that are rich in animal products because they use fewer natural resources. If you didn’t read the 2009 statement, if you’re curious to read the 2016 statement, or if you’d like an evidence-based paper to share with those who may have questioned your lifestyle, this is a great study to reference and share! 3. An interesting article in Wired about a new social networking app that harnesses the power of crowdsourcing to help alleviate depression and anxiety–or at least, that’s the vision of its founder, Robert Morris. The app, Panoply, allows users to share scenarios or sensations that have triggered anxiety and receive immediate feedback that helps them to reframe their experience. Over time, the site is supposed to promote a kind of cognitive behavioral therapy in which anxiety gives way to less triggering or fear-based responses. When I first read the article, my mind jumped to all of the ways in which the app might misfire: as someone who suffers from anxiety, the idea of sharing my fears with a group of strangers–and inviting their feedback, no less–is absolutely terrifying. (I realize that I write about my anxiety often on this blog, but usually that’s after I’ve had quite a bit of time to process it and find center again.) And I’d worry about abuses to the app, or responses that end up worsening the feelings of people who are at their most vulnerable. Still, early research and feedback on the app is highly promising, and Morris makes a sincere and impassioned case for his logic in creating it. I’ll be curious to hear how the app is received, and I certainly hope it finds an audience of folks whom it can help. 4. I was so moved by Statnews‘ glimpse at the online life of Stephen Wheeler, a manufacturing specialist who passed away from lung cancer just about a year ago. A shy and reserved man, Wheeler found community and solace toward the end of his life in an online patient community; when his wife requested transcripts of his discussions after his death, they came to more than 1,000 pages. It is a beautiful testament to the power of patient forums and communities. For me, the article is also a tribute to the safe and unfettered sense of self-expression that can emerge online. For many of us, the internet offers a sense of connection and mutual understanding that is unique to our virtual relationships–not a replacement for our “IRL” interaction, but something different and incredibly meaningful. I’ve experienced this through blogging, and I can only imagine how patient-driven online spaces might help those who are facing unwanted and frightening diagnoses. 5. Finally, the sweet story of a cow named Betsy and her calf, Nutmeg, whom she guarded fiercely throughout his early life. The article is sad in that it calls attention to the trauma dairy cows experience when their young are forcibly taken away, but the ending is happy, and the images are so touching. On this tender note, I’m wishing you all a great Sunday. Sweet things lie ahead on the blog this week! I’m finally able to catch up a little on my reading, and your blog always provides such though-provoking articles. I was especially interested in Stephen Wheeler’s article since my dad too had lung cancer and passed away eight years ago. The phrases “beat” or “lost to” in the cancer fight often bothers me as well, and it’s comforting to know that others share the same sentiments. To me, all cancer patients are fighters and winners in every sense. And thanks also for sharing such beautiful recipes with us- you have a knack for great finds.